Our life, a Jigsaw: The instant hit - the new Fire Truck bed !! 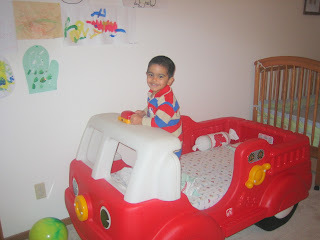 Vansh was truly overjoyed to see his new Fire Truck bed. After many days of see-sawing between the decisions of buying another crib for him or a toddler bed, we finally settled on this one. For a strong headed 2 year old like ours, we knew we had to get him really excited about something new in order to try it. Its not very common for a kid to refuse trying even ice-cream or chocolates because they don't look like his regular food. Fortunately, Vansh took a liking for it from moment one and just couldn't get enough of it. He jumped and he rolled and he checked out all the wheels and the lights, giving sound effects of 'peep peep, zooooom' ad interim. The first night was kind of strange because when Ashwini went after about 45 minutes of putting him to sleep to check whether he was sleeping fine, Vansh just got up and out of his bed to accompany Ashwini out of the room. We tried a lot of coaxing to get him back to sleep but didn't succeed. Ultimately I had to lay him down in the crib for him to go to sleep. Honestly I was scared whether he had decided to stick with the conventional this time as well. But thankfully he did just fine during his nap and his night sleep yesterday. The good part is that he doesn't get out of his bed, even though he can when he wakes up. The habit of sitting up in the crib and calling out for us is sticking too and I am in no mood to show him that he can actually get out himself now cos I don't want to find him knocking at the door in the middle of the night.